Just down the street and around the corner from our Laguna Niguel site, another residential project broke ground this past week. While the majority of the work is nearing completion at the first location, demolition is well underway at the second, with the preparations for new foundation and footings, including rebar and associated site work scheduled for the coming weeks. As depicted in the rendering below, the re-imagined facade below reflects a modern aesthetic consistent with the neighboring homes within this distinctively mid-century community of Niguel West in Orange County. To achieve this, the design maintains the linear nature and horizontality of the existing single-story home, allowing the exterior to reflect the new floor plan, which is focused on the enclosure of the existing entry courtyard. 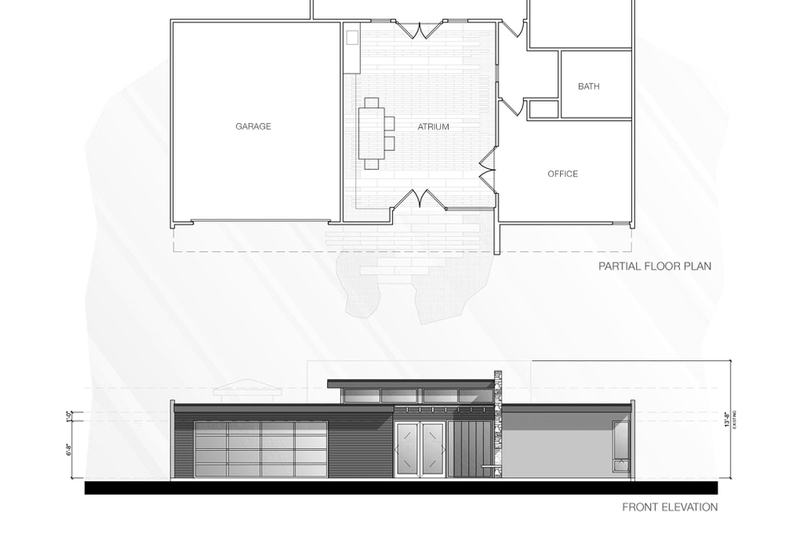 The addition adds approximately 400 square feet of flexible living space to the home; a raised ceiling and clerestory windows allow for light and ventilation at the new space. At the exterior, a new flat roof at the atrium enclosure informs the massing at the front facade, creating movement and interest through changes in building height and material. With the removal of the exterior courtyard wall and original awning structure, the home's transformation is already taking shape. As work progresses, it will eventually extend to the front yard with new hardscape and drought-tolerant landscaping. Find more details on the design process and other iterations at previous blog posts, and visit the project portfolio page to view renderings and construction photos.